1. Mix the pancake batter. In a hot frying pan pour out the batter for mini pancakes. Each cake should be about 2 inches in diameter. 2. In a blender, liquify half the strawberries. You may need to add up to 1/4 cup of water. 3. Pour the strawberry sauce in a sauce pan and let simmer, stirring regularly. If you want, you can add corn syrup to thicken and sweeten the sauce. 4. 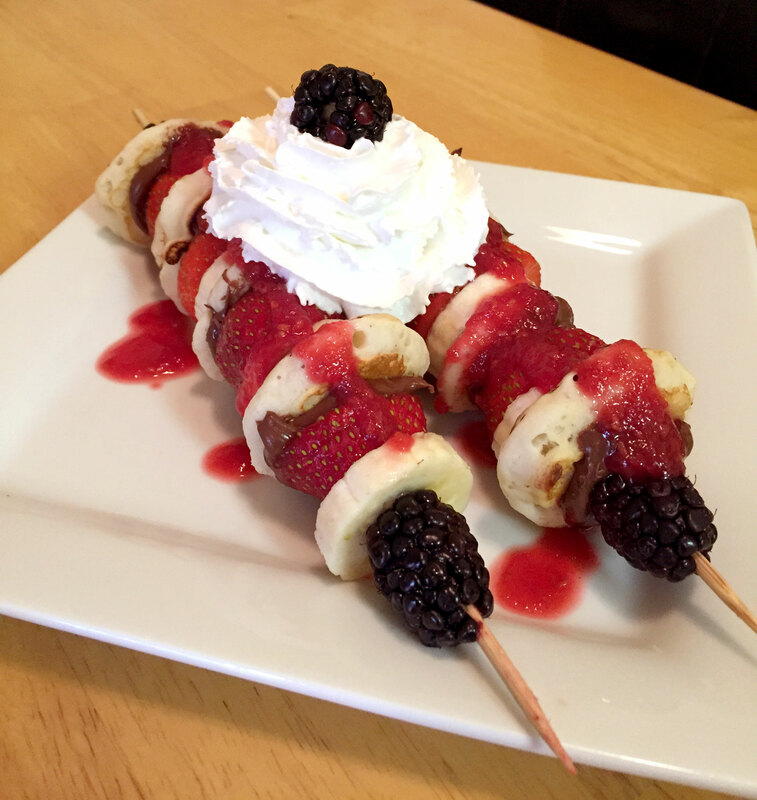 Spread Nutella on each mini pancake then put the fruit and mini pancakes on the skewer. We found that starting and ending with fruit worked better. 5. Pour the strawberry sauce over the skewer and top with whipped cream. One Mother’s day I wanted to do something a little nicer for breakfast for my wife. This Breakfast Kebab is what I came up with, I know a kabab is meat based, so this technically isn’t a kebab. My “kebab” has mini pancakes sandwiched between fruit on a skewer. The whole thing is topped with a strawberry sauce and whipped cream. They are fun to eat and taste light and are full of sweet flavor. And, yes, my wife loved them!